Nun darf ich es endlich ausplaudern ;-) : Ich bin Gastdesigner im Monat April fÃƒÆ’Ã‚Â¼r Beyond Appearances. Die Challenges sind immer eine wirkliche Herausforderung und ich bin ein groÃƒÆ’Ã…Â¸er Fan der dortigen Designteammitglieder. Diese Woche sollte man ein Layout ÃƒÆ’Ã‚Â¼ber etwas erstellen, wofÃƒÆ’Ã‚Â¼r man vielleicht von anderen kritisiert wird, weil es nicht angesagt ist, aber “Na Und?”. Journaling: I can be blatantly honest. So what? If things are bothering me totally – I feel the urge to say loud what I think! I can’t do anything against it and I get goosebumps to think I have to shut up – even if I know that I could ruin my chances. I need to say it, to keep my feet on the ground. I don’t sell my soul. I don’t want to be responsible for inequity because I don’t speak up. I don’t want bad history to happen again and be future and then now again. 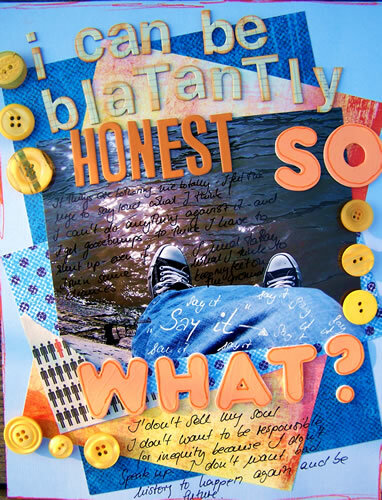 Supplies: Chatterbox, Prima Paper, Danyeela Patterned Paper, Heidi Swapp Chipboard Letters, American Crafts Foam Thickers, Acrylic Paint, Buttons. In zwei Wochen werde ich dann das Thema vorgeben bei Beyond Appearances – ich freue mich schon darauf. In two weeks I will be responsible for the challenge theme by Beyond Appearances – I’m looking forward. Euch einen schÃƒÆ’Ã‚Â¶nen Tag – I wish you a gorgeous day! Congrats to you! When are you going to post your blog challenge? I bought a new glue stick! That is so awesome! Congratulations!!!! woohoo…If you are the guestdesigner…I no longer have an excuse to NOT take a dare from Beyond Appaerances.